WHAT IS IT? The PTI will be something like an alternative university, or maybe better: an alternative-to-university. The idea is to bring together a bunch of engaged, interested people to talk about theory, ideas and practise for radical social change. We’ll have a great time, meet good people, get our praxis challenged and with luck refine and renew our ideas, politics and energies. Importantly, the conversations will very deliberately cut across radical orientations – anarchists, socialists, lefties, progressives, anti-colonialists, anti-authoritarians, ecologists of all stripes are welcome. The idea is to work, think and talk together – to articulate and comprehend differences sure – but to find common ground, get beyond factionalized pettiness and stimulate radical ecological and egalitarian social change. We want to get good people with good ideas together to talk and listen to each other. WHAT WILL THE SCHEDULE LOOK LIKE? Essentially all three weeks will follow the same pattern. We will be running 6 days a week with Sundays off. We will be offering 8 morning classes of which participants will be able to choose up to four to attend. Then we will all have lunch together, then every afternoon community work placements will be offered. Evenings will be a mix of open-space activities, shows, speakers, films and free time. WHAT WILL THE CLASSES BE LIKE? We have put together an awesome roster of instructors and speakers including Astra Taylor, Cecily Nicholson, Carla Bergman, Am Johal, Matt Hern, Geoff Mann, Glen Coulthard and lots more. The classes will be fairly rigourous (loosely at an upper-year university level) and include a certain amount of reading and some writing. Attendance is not mandatory and you can engage with as much or as little as you like. 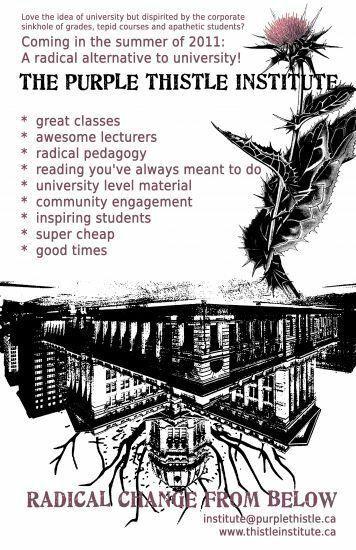 The classes include: Decolonization, Activist Art, Urban Studies, Deschooling, Understanding Economics, Contemporary Social Philosophy and Critical Theory. WHO IS THIS FOR? The PTI is for anyone, of any age, but we will be giving priority to youth, racialized and low-income folks. As mentioned the classes will be pretty rigourous intellectually, but please don’t let that scare you off. The language will not be overly academicized and as long as you like to read, think, talk and listen you’ll probably be OK. The one real requirement is that you are keenly interested in radical social transformation and come with a generous spirit ready to listen and collaborate. WHAT WILL IT COST? The three weeks are priced on a sliding scale: $350 - $500. This includes lunch six days a week. If you are coming from out of town, need a place to stay and want to kick down an extra $100 we will find you a good billet who will give you a bed and feed you. There will be a few bursaries available, but we are going to need most people to pay at least the minimum. HOW DO I APPLY? Hit us with an email at institute@purplethistle.ca and we’ll send you a formal application and instructions. How about an anti oppressive space? Far to many so called activists and social justice types are homophobic/transphobic and are basically oppressive on many levels. Purple Thistle is no exception. Are we trans/homophobic too? I'm not being facetious: I actually want to know if that's been a problem.